The one thing about striped crocheted blankets is all the ends you have to weave in at each color change.. two at each join, to be exact. :-) I have been good about doing this chore after each block of colors, and I finished the blanket body a day before yesterday and then commenced on darning in the ends. I have a few more to go and then the wait for one more week for Lucy to announce the border design and colors. 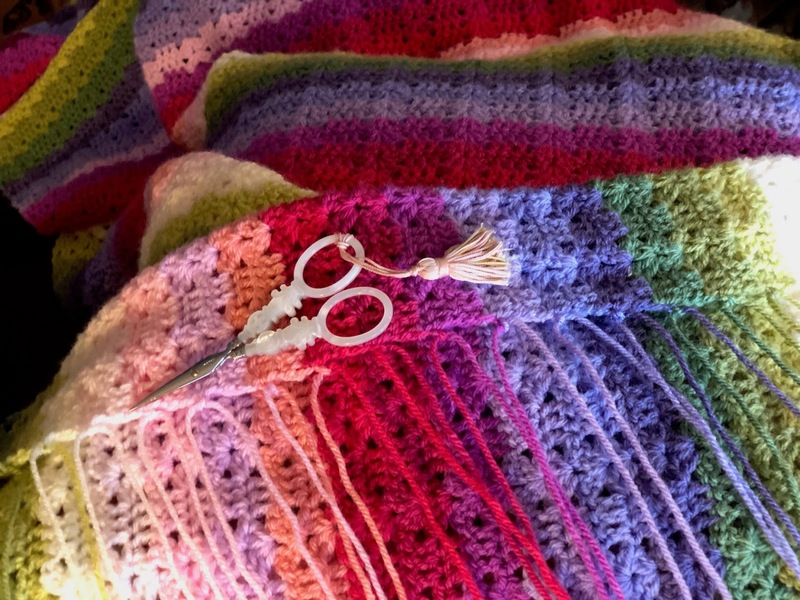 I have created a nice little technique of my own which works so well you can hardly tell it's the "end" side of the blanket. 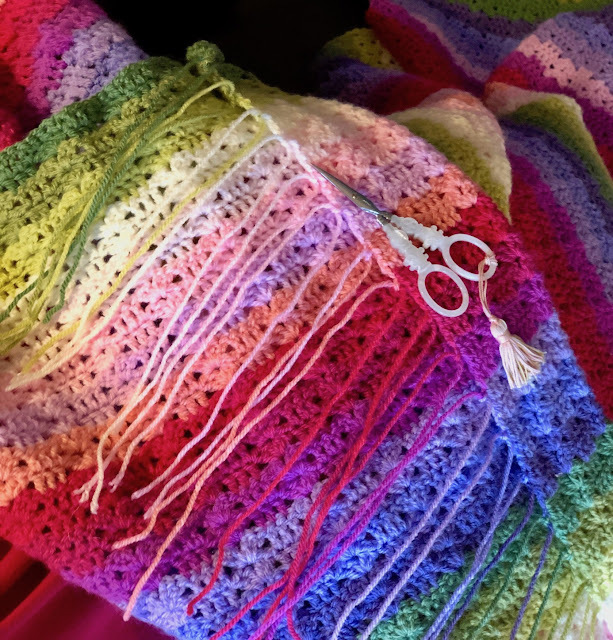 :-) I add the new yarn and tie a square knot, when I sew them in I use a darning needle and sew through the blanket yarn and draw the knot into the yarn so you can't see it, then I weave the needle through the crochet so you can't see it, through and through and then snip it off. Several years ago I spied somewhere this pair of sewing scissors and got obsessed with finding a pair for moi. 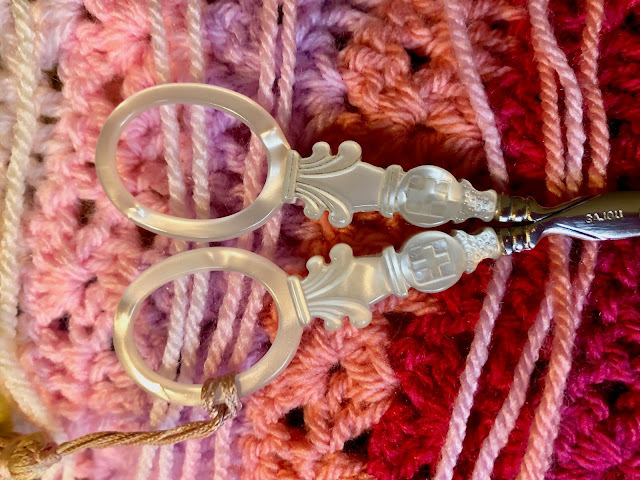 They are made in France by Sajou with faux handles of ivory, mother-of-pearl and tortoise shell. I've also gotten some Sajou linen threads for my hand-sewing projects and repairs. 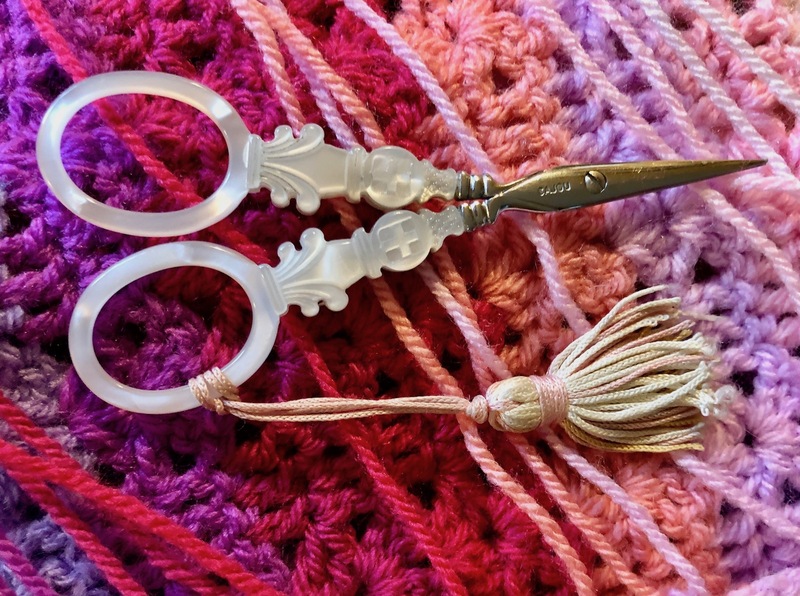 What are your favorite sewing or embroidery scissors? Do tell! Dayle was going to volunteer with me at the falls yesterday as my friend Shirley had seen snow was possible there and lives quite far away and didn't want to risk it. But we got a call from the falls by the volunteers doing the morning shift and they said it was snowing like crazy there and recommended we not go. So, we had a nice afternoon and then headed to our dinner reservation at Bumper's Grill for our Valentine meal. 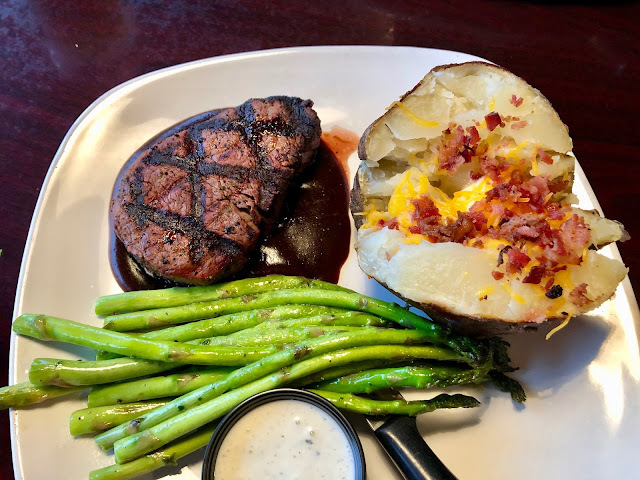 :-) Filet Mignon, baked potato and asparagus. YUM! 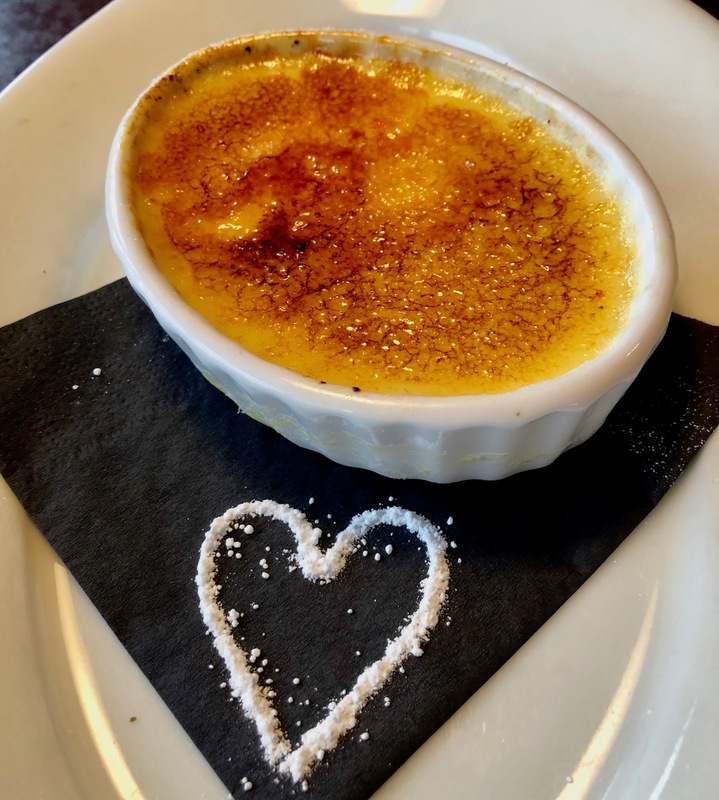 For special occasions we indulge in dessert so we shared a crème brûlée. They make an exceptionally good one there! A very thin topping, torched sugar makes a crispy crust, the vanilla custard is smoooooth and creamy. Delish! 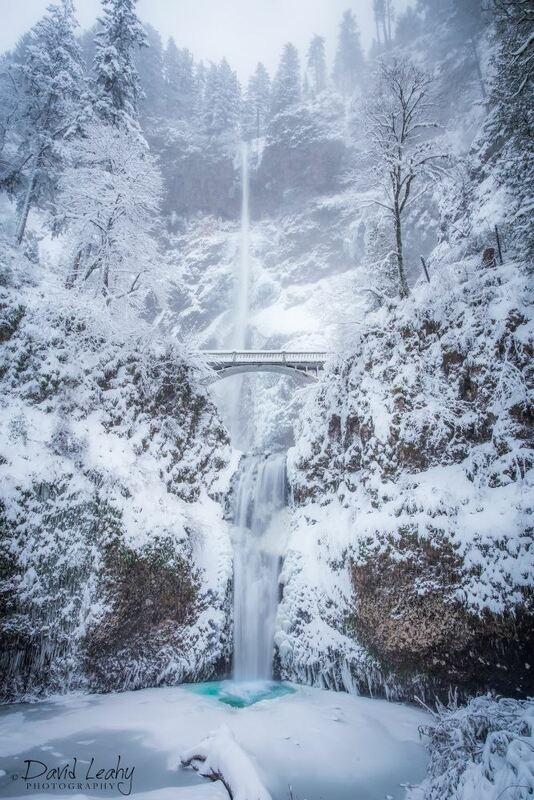 I'm sharing another amazing photo of Multnomah Falls found on Facebook. The photographer's name is on the bottom. Isn't it gorgeous? Guess what I'll be doing today? Packing up my Valentine decorations, putting the heart decorated tablecloth in the laundry, and putting a fresh cloth on the table. AND.. sewing in the rest of the ends on my blanket. Then I'll have to figure out what project to do next. Have a fabulous weekend.. any big plans? Please share your method of sewing in the ends. Beautiful! I love to crochet but I don't have the patience to make all those color changes and sewing in the ends! You are a wise woman, sewing in the ends as you go, especially with that many color changes. I know so many people who finished a big project like that and then never finish sewing in the ends and so it gets stashed away in a closet never to be seen because the task seems so daunting. It is a beautiful blanket and I love your scissors too. My scissors are a pair of little multicolored 4 inch scissors with a 1 inch blade that I won from another blog a couple of years ago. They’re perfect on my side table. I probably should put my valentines things away but I think I will wait until Monday and enjoy them a few more days. It seems early to put the spring things out when the snow is still falling outside. We were supposed to have Bible study at our house last night but because the snow got so heavy we ended up canceling. We didn’t want people to have to be out driving in the dark with slick roads. Dennis ended up bringing Panda Express home for our dinner. It was delicious and I didn’t have to cook so I was a happy camper. After having physical therapy yesterday I was in quite a bit of pain and I wouldn’t have wanted to go out even if we could. Enjoy your weekend my friend. I think a cozy day at home sounds perfect. All those ends are a big hassle but it is worth it in the end..... Love to you and Dayle, Happy Valentine's Day a bit late. 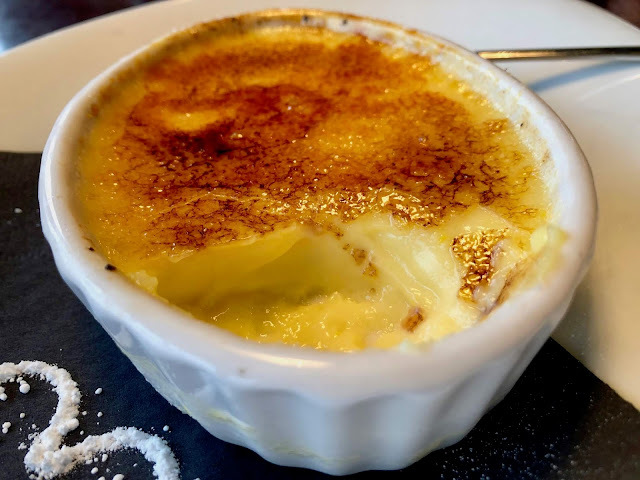 Ah........Creme Brulee -- my favorite as well. The same method I use for sewing in the ends, I just wish I could discipline myself to do it as I go along rather than leaving it until the end. Your meal looks delicious...yum! The snow is pretty, but it makes it hard to make concrete plans at this time of year. There's always a chance of slippery roads. The last few weeks it has seemed like the only days we've had bad weather are the days I've made plans. And I'm a scaredy-cat about driving if the roads are at all bad. But I think I would brave the roads for that crème brulee! We had some warm-ish weather over the weekend, but back to winter temps now. Your dinner looks so good. I just had some soup for lunch, but looking at that picture I am hungry again! Your blanket is really nice Teresa...so at the end of this week you'll get the instructions for the border? Can't wait to see. I'm also really loving the winter pictures you are showing of "your Falls." Gorgeous!